This is an open event to the public, students do not need to be 21 to attend. The event is this Wednesday the 27th at 6:30. Fine Arts Event! 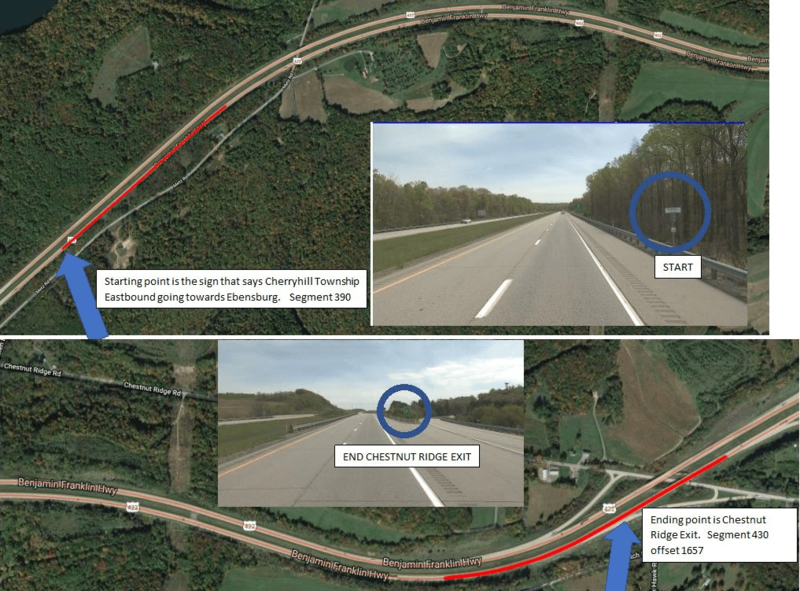 The SEEDS Club will be holding a highway cleanup Saturday, April 6th from 11 AM to 3 PM. If students are interested, send an RSVP to Amy Walker at wjvx@iup.edu so they know how many vests/gloves/garbage bags to bring. 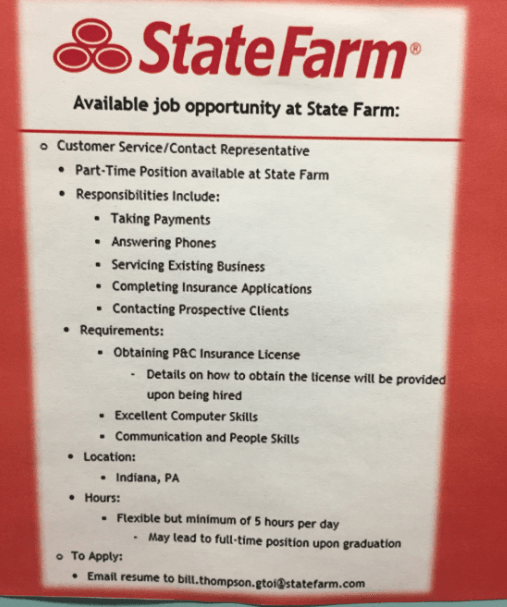 Job Opportunity! 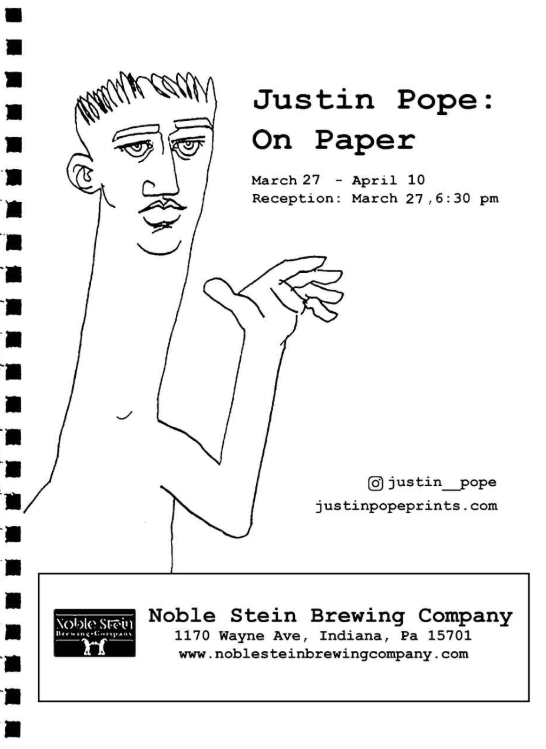 Contact qsjw@iup.edu with any questions. Start date would be in May. It’s a great experience for a resume for business majors. 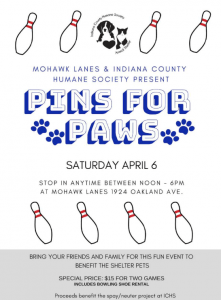 Beth Finegan is looking for volunteers on Saturday April 6th from noon until 6pm Mohawk Lanes is sponsoring a fund raiser for the Indiana County Humane Society. For $15 bowlers get 2 games and rental of bowling shoes. Proceeds will benefit the spay/neuter project at the shelter. It is ICHS’ goal to spay/neuter all the pets at the shelter before they are adopted into their furever homes and, initially, we have over 100 cats and dogs that need this surgery. By participating you will be part of the success of this “fix the shelter pets” project and it will be a fun way to raise some money! 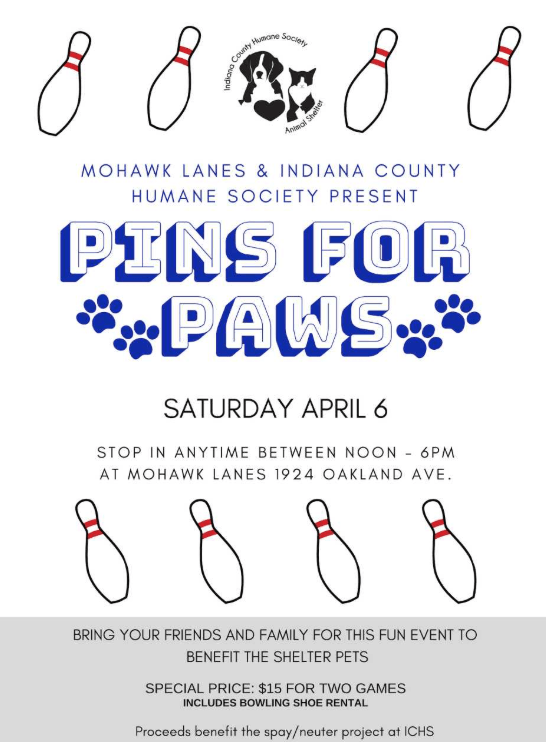 Again, bowlers can bowl anytime between noon and 6pm on April 6th at Mohawk Lanes and the cost is only $15. You get 10 hours of community service for participating!! Seeking volunteers to staff Giant Eagle with 4 people on April 13 and 14 from 10am-4pm. They’ll be collecting monetary donations for the Indiana County Community Action Program (ICCAP). Please let Kevin know if you are available!! 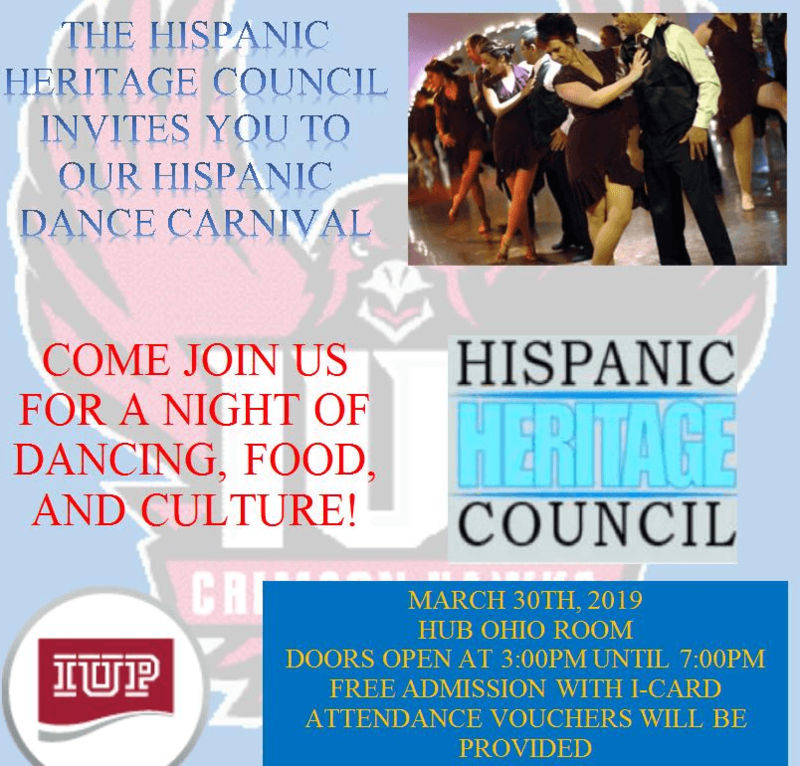 The Hispanic Heritage Council would like to invite you their Hispanic Dance Carnival on March 30th. 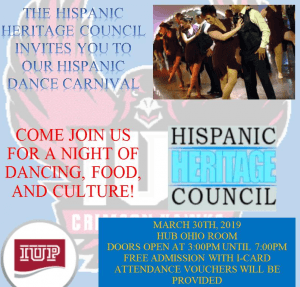 Come and join them for an event full of fun, food and culture! 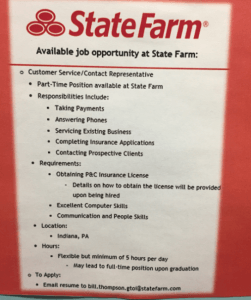 Pay rates can vary by position and location, but the pay for a census taker position in Indiana County is $13.50 per hour, in Allegheny County the rate is $18.50 per hour, in Montgomery County, PA the rate is $20.50 per hour, and in Philadelphia County it is $21 per hour. Census takers also receive reimbursement for work-related mileage and expenses, where applicable. Representatives from the Census Bureau will be in the lobby of the IUP Humanities and Social Sciences Building on Tuesday, March 26, 2019 from 11 a.m. until 2 p.m. to answer any questions you might have about these positions. · Have a valid Social Security number. · Have a valid email address. · Be registered with the Selective Service System or have a qualifying exemption, if you are a male born after Dec. 31, 1959. · Pass a Census-performed criminal background check and a review of criminal records, including fingerprinting. · Commit to completing training. · Be available to work flexible hours, which can include days, evenings, and/or weekends. · Have access to a vehicle and a valid driver’s license, unless public transportation is readily available. · Have access to a computer with internet and an email account (to complete training). 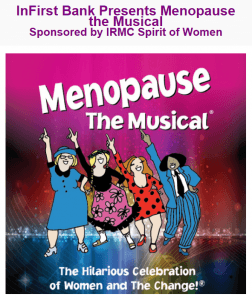 Menopause The Musical® is a groundbreaking celebration of women who are on the brink of, in the middle of, or have survived “The Change.” Now celebrating 16 years of female empowerment through hilarious musical comedy, Menopause The Musical® has evolved as a “grassroots” movement of women who deal with life adjustments after 40 by embracing each other and the road ahead. The Evergreen Conservancy is seeking up to 5 volunteers to help with work at the Tanoma Acid Mine Drainage project and outdoor classroom next Thursday from 12:30-3:30 PM. Work will include raking paths, cleaning signs, doing some simple maintenance in the outdoor classroom. Transportation will be provided. If you are interested, let me know and I will put you in touch with the project coordinator and the other volunteers. I will follow up with final instructions including a departure time and place ASAP. Mrs. Jacque Benhart from Upward Bound Math & Science is looking for help unloading a truck with Marianna’s hoagies/pizza and organizing for school delivery/pickups on April 9. They need help from 9am-2pm and are offering service hours. 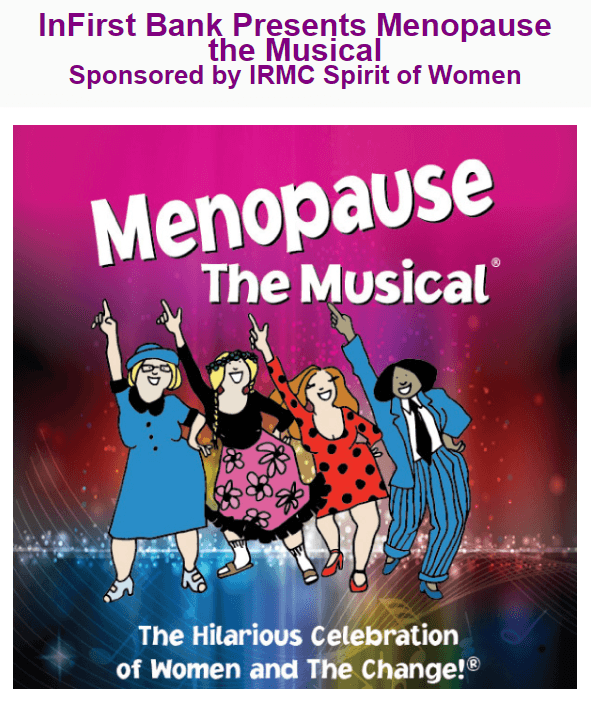 If interested, please can contact Mrs. Benhart at j.s.benhart@iup.edu. The Friends of Yellow Creek are organizing a volunteer work day at Yellow Creek State Park at 10 am on Saturday, April 6th. If you need community service and don’t mind sweating a little bit for a good cause, let Kevin know. They’ll no doubt put in several hours that day working (lunch provided). If you’ve not been to Yellow Creek it is a very pretty place about 20 minutes from campus. 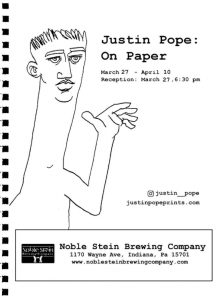 Since Kevin is working the IUP Expo that morning he won’t be at the park the entire time, but will be available to transport several participants to (and from). If you have a car and can transport some people please let Kevin know. He’ll give extra service hours to offset the cost of gas. Last year they had about 30 participants and are shooting for at least that many again this year. Let Kevin know if you are interested and he will follow up with more information!